When David Perry texted me last week about the possibility of a streamer float, I made sure to clear my schedule. A day on the river throwing streamers is tough to turn down. 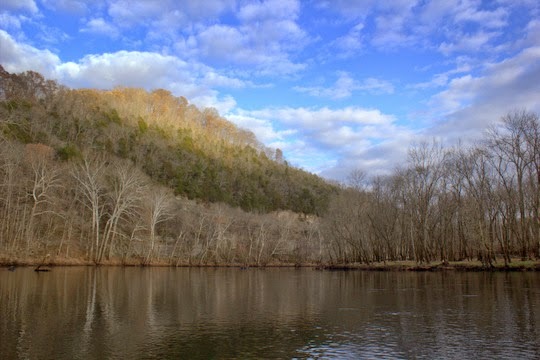 The flows on the Caney have been a bit erratic lately but drifting and throwing flies is better than sitting at home. 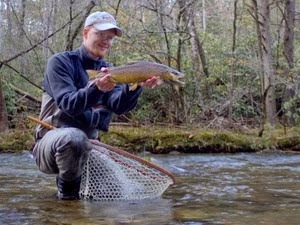 A 9:00 a.m. start was a welcome change from some of the early mornings I have to put in for fishing over in the Smokies. After meeting at the ramp and dumping his boat, we were soon experimenting. On a guides' day off, lots of experiments go on. This is part of what helps a good guide keep things dialed in as well as scratch the curiosity itch. Some deep nymphing was attempted but for the most part we stayed with the streamer game. I had several early drive by swings from fish who weren't interested in a second look, but after switching rowers a few times, neither of us had yet connected. Finally, a good half way through the float, we got to the one bank I had been looking forward to fishing. I had on a new rig that someone showed me earlier this year that has a ton of potential. It uses a tippet ring to set up a two streamer rig with a larger streamer chasing a smaller one. 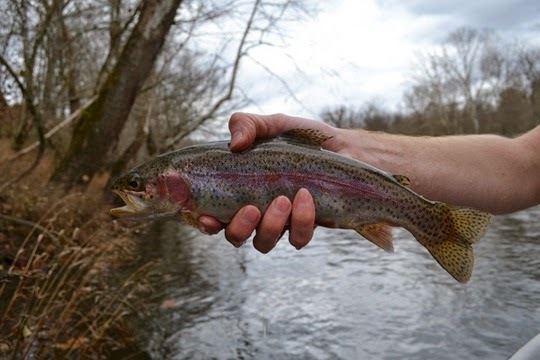 Sure enough, after just a few moments on this bank, a beautiful rainbow clobbered the larger of the two flies. After a quick picture, I dutifully offered to take my turn rowing. On slow days, it is usually reasonable to switch after just one fish. David P. generously offered to row a little bit longer, and I didn't take time to argue! Just a few feet more down the bank, I made a perfect cast to the bankside water, let the sinking line get down for a couple of seconds, and then started the retrieve. On the second strip the line came tight and with the flash I knew it was a nicer fish. 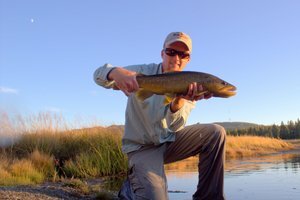 With a 7 weight it would seem like you could horse one of these in a little faster, but this fish bulldogged like the brown trout that it was. Each time I got it close to the net, it managed to get its head back down and take off again. Finally, we got it in the net, and I noticed it had taken the smaller of the two flies. Maybe it thought it was racing the other streamer to the food. Whatever the reason, the two streamer rig had worked to perfection, and I was happy. Naturally, when I again offered to row, David P. quickly accepted. In fact I think he would have tossed me out of the boat if I didn't row after getting such a nice fish. Over the rest of the float, he boated a good number of fish including a beautiful brookie and a 16 inch brown right near the takeout. We never did see that monster we were looking for, but that's streamer fishing for you. I'll happily take the quality fish we did find any day. 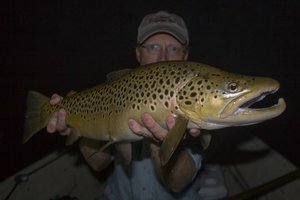 If you are interested in a day of streamer fishing, the river is dropping into the sweet spot and should provide great streamer action through the colder months. 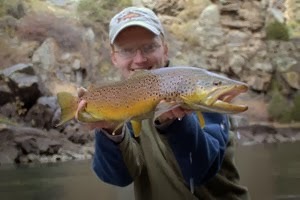 Just give me a call or drop me an email at TroutZoneAnglers@gmail.com to set up a trip! No clues as to what streamers? Mark, the larger of the two streamers was basically a Stacked Blond in yellow (see Kelly Galloup's book for more on that fly). The smaller fly that was getting chased was a little white fly that is my own personal modification of a Clouser (in white). Love throwing streamers. Looks like a great day, even if it started off slow. Congratulations sir. 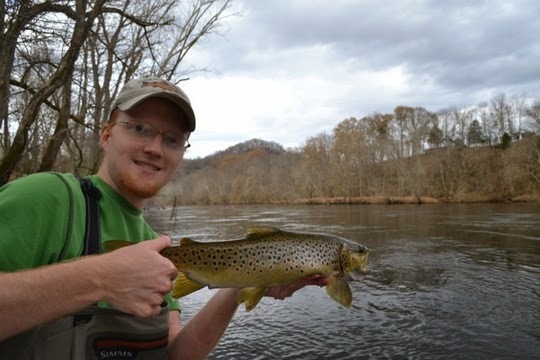 I always have to chuckle to myself when I get a little brookie streamer fishing. Thanks Atlas. 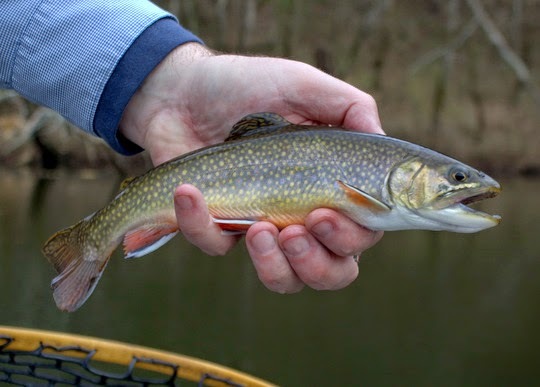 Those brookies certainly have an appetite and always surprise me by what they are willing to tackle. Whenever I go fishing now I fish streamers half the time. Kevin, I've been fishing them more and more, probably even more than I really ought to if catching fish is my goal. 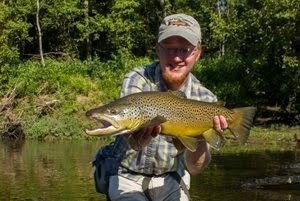 There is just something about watching a fish chase down the fly that is incredibly fun and addicting!